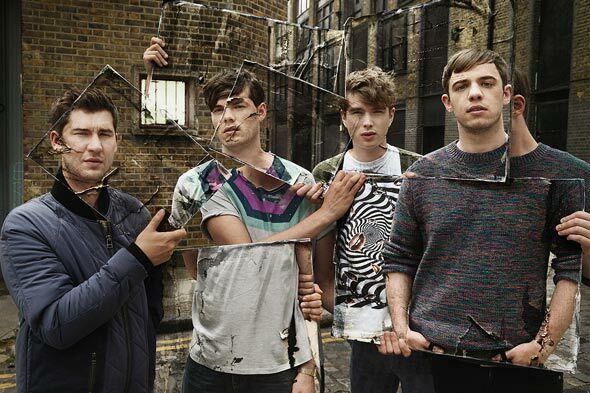 Everything Everything are a band we can't keep off repeat at the moment and if you've got very keen ears you may have even heard them on our spotify playlist. If not you can head over there now... there's a whole mix of tracks you're missing out on! After seeing the band Everything Everything by chance for the first time at Reading festival, I eagerly awaited their sold-out Southampton show at The Talking Heads. Surrounded by an assortment of people of all different ages, I waited for the foursome to take to the stage getting more and more impatient by the minute in the small and stuffy venue. From the moment that Mike, Jonathan, Jeremy and Alex stepped out however, the atmosphere was electric. Jonathan’s unique and powerful voice filled the room whilst the rest of the band sang in the background creating an almost choir sound as they sang in harmony. What’s really admirable about this band and made the evening even more special is that not only are they exceptionally talented but they also enjoy themselves and this definitely reflected in their show. You could tell this particularly towards the end of the evening when the music became louder and the vocals became more passionate. The highlight of the evening for me was the performance of ‘Leave the engine room’ throughout which Jonathan’s slow and soothing voice engulfed the crowed sending them into a subdued state of awe. They ended with ‘Photoshop handsome’, which got everyone in the crowd moving with energetic beats and jolted singing. Everyone in the room was having fun, including the band and the atmosphere was amazing - a perfect way to end the evening.